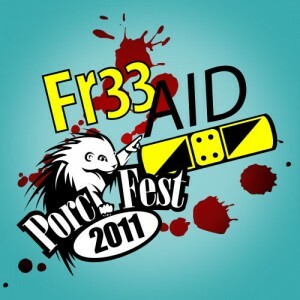 The idea behind Fr33 Aid is to facilitate connections among liberty activists who want to volunteer for mutual aid projects. We’re organizing the first aid tent at the Porcupine Freedom Festival coming up in June, and we’ll be located at RV site #2 in Agora Valley. From there, our all-volunteer staff will be providing basic first aid, educating participants about CPR, providing blood pressure screenings and offering health related items for sale. We’ll have fresh water and first aid for doggies too. I had a BLAST last year at PorcFest and met many new friends that I’ve kept in touch with. I brought my defibrillator and shared space with Xaq and Garland from Fr33 Agents as well as Jeff, a doctor on our team who also sells beef jerky. Fortunately, we didn’t have to use my defibrillator last year, but I brought it just in case someone experienced cardiac arrest. There are a lot of people who attend PorcFest each year, and if anyone had a cardiac arrest I wanted to give them the best chance of survival. In the PorcFest community of liberty lovers, I knew there had to be others with medical skills, and I wanted to connect with them before this year’s PorcFest. Garland encouraged me to build on my vision, and after she interviewed me for the Happy Porcupine newsletter last fall, we decided to start Fr33 Aid. So far we have 20 volunteers. The team we have lined up for PorcFest includes a doctor, a paramedic, EMTs and nurses, an MD student, an occupational therapist and a surgical/ medical assistant. About half the team is located in New Hampshire, and the rest of us are coming from farther away to enjoy PorcFest. It’s a lot of fun to work with this team; they inspire each other and me with their energy, ideas and contributions. Currently we’re gathering the supplies we need for our programs at PorcFest. We’ll have a defibrillator in case of cardiac arrest, and our EMT and paramedic volunteers will bring their jump bags with bandages, medications, splints, diagnostic equipment and other items. Garland donated her artwork for Fr33 Aid gear, and she and Xaq donated the volunteer T-shirts. Another team member is donating her table. We still need a CPR manikin or two and a pop-up tent. If you’d like to help us out, please visit http://fr33aid.com which currently redirects to our Facebook fan page. From there, you can “like” our page and share it with your friends, or click on the “Donate” or “Volunteer” tabs.